What is a Hydrafacial? HydraFacial is an innovative breakthrough in today’s skin care. As the name implies, it hydrates the skin. Virtually everyone knows that red, dry, irritated skin will increase the visible signs of aging. What’s the solution? Hydration. Well-hydrated skin equals healthy skin. HydraFacial is a different kind of skin-enhancing treatment simply because of how well it thoroughly hydrates and improves the overall appearance of skin. HydraFacial is a non-surgical, non-invasive treatment that delivers immediate results for improved texture and skin tone without any discomfort or added downtime to recover. People who use HydraFacial experience instant results leaving their skin more moisturized, soothed, non-irritated, and more attractive. HydraFacial treatment takes a multi-approach to enhancing skin. Vortex Extraction – The vortex (strong circulating liquid) can easily extricate and eliminate a variety of skin blemishes including blackheads, sebum, and whiteheads for painless and instantaneous extractions. LED Light Therapy – LED light therapy offers even more benefits following a HydraFacial treatment. It utilizes certain kinds of light that emit energy to encourage cell growth, thereby increasing the production of your skin’s elastin and collagen. Over time, the skin becomes less wrinkled, firmer, and younger looking overall. Light therapy also helps to improve the resilience and firmness of the skin, while greatly diminishing the appearance of wrinkles, fine lines, and other visible signs of growing older. Antioxidant Vortex Fusion – The special spiral tip uses a patented approach for using well-hydrated skin solutions as well as infusing strong antioxidants into the skin, which diminishes the appearance of wrinkles, fine lines, hyperpigmentation, and oily skin. Exfoliation – Exfoliating the skin is essential in maintaining its health. The HydroPeel innovative tip utilizes its abrasive, multiple edges in order to exfoliate the skin thoroughly many times over to achieve better skin resurfacing minus the irritation, discomfort, and redness. HydraFacial serums are designed to target certain skin problems, such as blackheads, whiteheads, brown spots, acne, sun damage, uneven skin tone, enlarged pores, and the fine lines of premature aging. However, HydraFacial isn’t just a temporary solution to brighter and more beautiful skin. It actually improves the overall quality of skin, which makes it healthier in the long term. 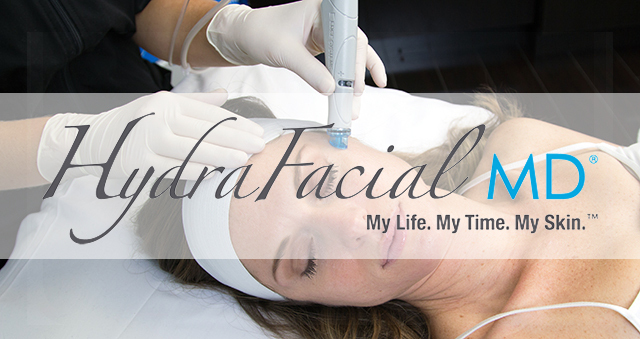 A HydraFacial treatment will leave your skin bright, attractive, and radiantly glowing.